Dale Lyon Branch 54 - Lewis-Clark Antique Power Club, Inc.
Lewis-Clark Antique Power Club, Inc., EDGE&TA Br. 54 is pleased to nominate Dale Lyon for Hall of Fame recognition for his 25+ years of outstanding service and support. Dale is a charter member of Branch 54 which was formed in the early 1990s. Dale is a quiet, private man but he has served and continues to serve the club in many ways. He served as club treasurer in 2001, 2002 and 2003; and, was on the board of directors from 2012 thru 2016. For the last several years Dale has taken on the task of doing all the “leg-work” to photograph club member’s tractors, engines and implements and produces a popular Lewis-Clark Antique Power Club calendar. Dale volunteers his time, photography equipment and expenses necessary to accomplish this task. Because of his stalwart dedication and willingness to serve EDGETA, and in particular Branch 54, with his near 100% attendance at quarterly meetings and special events sponsored by the club; and, because Dale has been unselfish in his willingness to share his collection and knowledge with members and others. Further, because he has always been willing to encourage new memberships and share his workshop with future EDGETA members. It was not uncommon to find his grandson working on a shop projects and he has taken the time to provide safe tractor-driving experiences to youngsters. 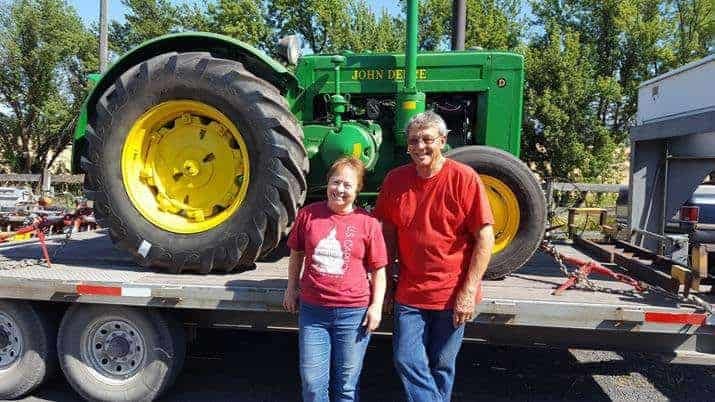 Also, because Dale has been open to sharing his collection for club shop-tours and even provided his heavy-duty pickup truck and trailer to move club member’s tractors and equipment. All of the above summarize why Dale Lyon deserves the selection committee’s utmost consideration for HOF recognition. Dale is a devoted collector, preservationist and exhibitor of antique tractors, engines and implements. Without question he is at the top of the list when it comes to collecting and preserving farm equipment heritage in the Palouse area (rolling hills) of southeast Washington State. Dale credits his farther, the late Robert Lyon, for inspiring his love of antique farm equipment. 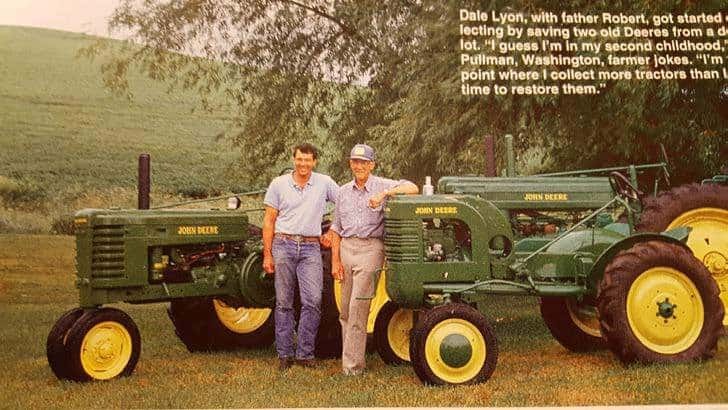 Dale and Robert were featured in the February 1994 issue of the Successful Farming magazine—Dale had just finished restoring three vintage John Deere tractors (picture below). Dale’s extensive collection runs the gamut. He is pretty much color-blind when it comes to tractors, engines, implements and machinery. His collection includes a 40-inch-cut Allis-Chalmers pull-type combine, several threshers, binders, a Citroen tractor, etc. And, over the years he has added two new storage buildings and purchased several shipping containers to house his ever increasing vintage collection of tractors and engines. Dale recently purchased this model D JD tractor from Lana Tout. Lana’s late husband Eddie was a 2012 inductee into the EDGETA HOF.